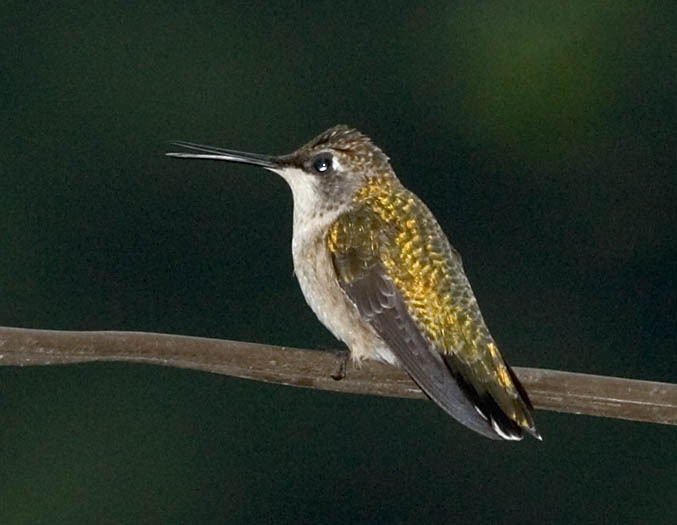 Hummingbirds aren't the color that they appear to be. That is, their feathers contain a pigment that is one dull color. The pigment is melanin. The colors that you see, such as blues, greens and reds are a result of several things including: 1) diffraction of light due to the regular spacing of the particles of melanin, interrupting certain colors; and 2) absorption of the remaining colors by the pigment. For a far more detailed and accurate description of this phenomenon, read this document and this document. 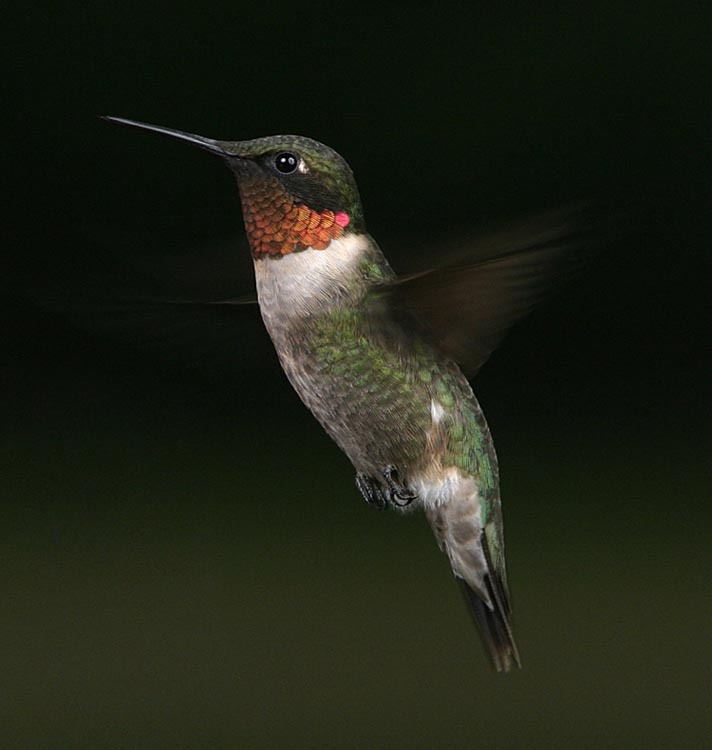 The explanation of how color is produced by a hummingbird's feathers also explains why you can only see the red in a ruby throated hummingbird's gorget when it is lit and viewed from certain angles. Some colors can be seen from wider angles than others. Feathers that aren't illuminated from the correct angle will appear colorless. This explanation for the hummingbird's color should guide you in your decisions on how to illuminate the hummingbirds that you photograph. It should also dispel some of the notions about natural light versus flash and diffused versus "bare bulb" flash or either of these methods showing more or less color. Some photographers suggest that point source lighting, like that from flash units with no diffusers (like umbrellas, reflectors and soft boxes), shows the "iridescence" of the birds. This may be true. People mean different things when they use the word "iridescence." 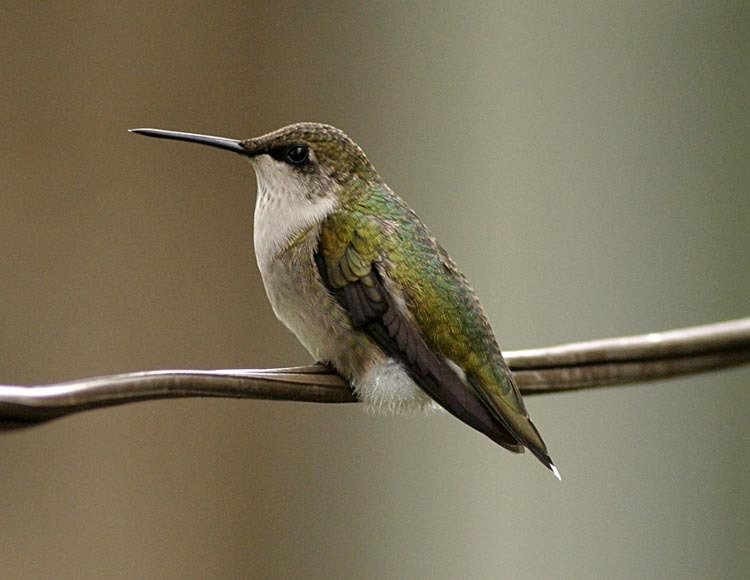 However, all hummingbird color (other than gray) is iridescent. So if you capture green, blue, gold or red in your photo then your photo has captured that iridescence. If what you are talking about is the change in color when the angle of view or lighting is changed, no static photograph can show this. What some refer to as iridescence in hummingbird photographs is really specular highlights. That is, reflections of the light source from the bird that contain nearly all the spectrum produced by the light source. I.e, bright reflections with little color. I mean this in reference to comments about iridescence from particular light sources because, I repeat, all hummingbird color is iridescent. All the color is there. The only areas with no color are feathers that produce little or no color and a small area of dark gray on the very back of the bird. I did manage to get one "hot" feather at the edge of the gorget, but even so, the result is simply altered color without a distracting bright spot. In the above image, you will notice even coloration marred only by a little glare. The glare is provided by that portion of the light source beyond the bird that is being reflected at oblique angles toward to camera. This is a problem not encountered when flashes are stationed on the same side of the bird as the photographer. 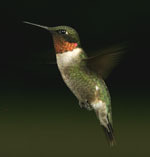 Then again, hummingbirds don't always cooperate by perching near your flash heads. Same Location, same conditions, add on-camera flash. The above photo show what happens when your primary source of lighting changes from an overcast sky to your on-camera, hot shoe flash. Ambient light is still playing enough of a role in the above photo to give color to feathers not golden with light from the flash, but for all the non-initiated would know, this is a different species. The above image is not a perfect comparison, but you should be able to see the difference. On the right are the reflective highlights from a single point source, a bare bulb flash mounted on the camera. On the left is a bird illuminated by two flashes with diffusers (an umbrella and a 9"x9" soft box). Notice the areas of gray on the bird on the right. 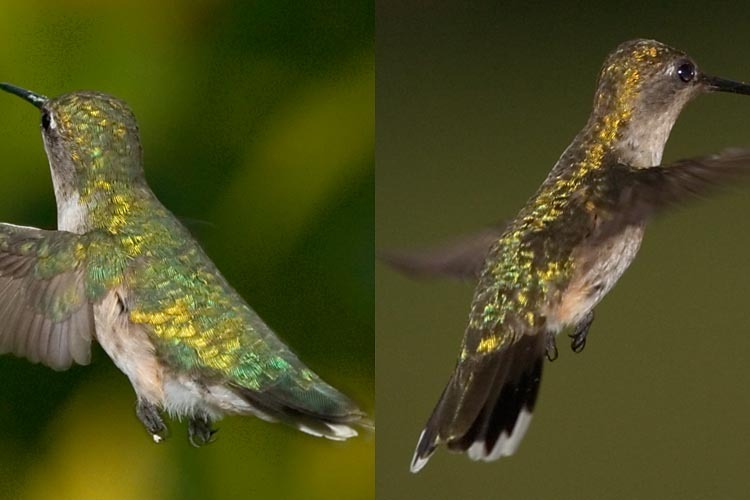 The bird on the left, being illuminated from a larger area or larger angle has much more of his feathers showing color. Both images were taken by the same camera, using the same lens with the same amount of saturation and sharpening done. In fact, only the levels were adjusted in Photoshop before the images were combined into one. One factor in producing specular highlights is the proportion of light that is supplied by point sources. In shade in midday in the summer, there will still be plenty of light from directions other than the flash to give color to the feathers that aren't positioned to produce color from the light supplied by the flash. However, if you increase flash output and decrease ISO and/or close your aperture your image will start to look more like the one on the right. The same will be true early or late in the day when the ambient light wanes. Another factor is the angle of the light source in relation to the camera. Specular highlights seem to increase when the flash is near the taking lens, just as red-eye increases in snapshots of people when the flash is near the lens, though probably the result of a different effect. The smaller the angle of the light source, i.e., the further you place the flash from the bird, the more pronounced the highlights will be, though this tends to level out after the flash is two meters or so from the bird. So if you want the bright highlights, put powerful flashes about 6 feet or so from your subject and keep the flash units fairly close to the camera, or close to the direct line from the lens to the bird. The opposite of point sources is what you want if you want your colors to look more uniform. You want a wide area light source. With flash units, that means umbrellas, reflectors or soft boxes. It may be possible to help out the sun with reflectors and other methods used by fashion photographers, but I have never tried this and do not know if this would discourage the birds from feeding near the reflectors.